So, when it comes to my laundry detergent, my main and favorite brand is Purex...and I don't just say that, it really is. I stock up when it is on sale and usually, it is a very economical price so it is worth it to me to have alot of it on hand. It works great and the scents are wonderful...I love scented detergent. 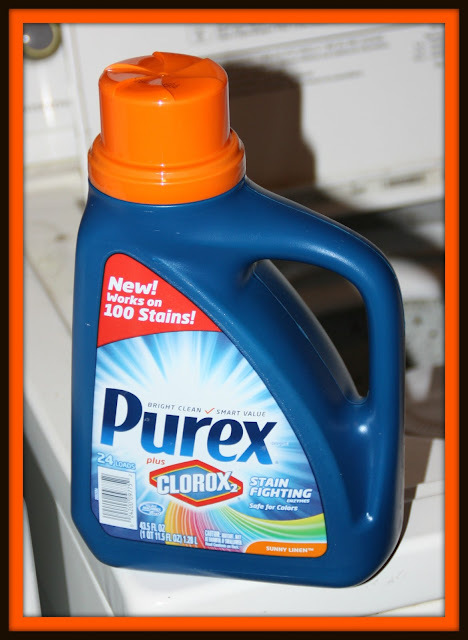 I am so thrilled to announce that Purex has come out with a brand new detergent that includes Clorox now! 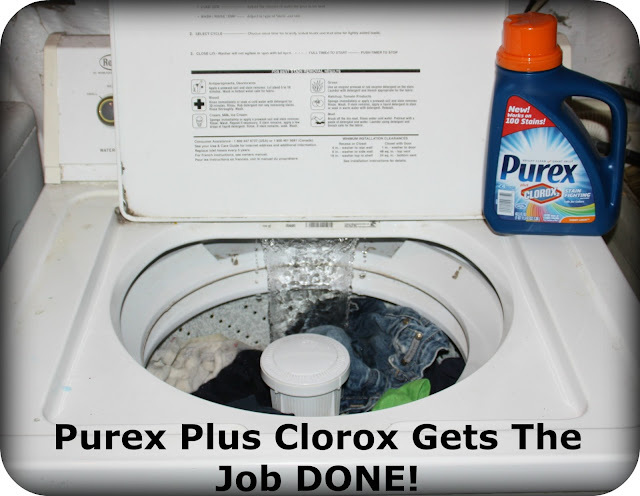 Purex Plus Clorox 2 is the latest and greatest addition to the Purex family and I am going to introduce you to it today. So. This is my life most of the week. Laundry up the wazoo, always something to wash. With the kid's clothes, I just throw everything into one load...I don't have the time to sort it all out. Call me lazy, call me naughty, call me whatever, I have one goal and that is to get it all done. My children's laundry takes up the bulk of my laundry time so it's nice to have a detergent on hand that is designed to specifically target stains. 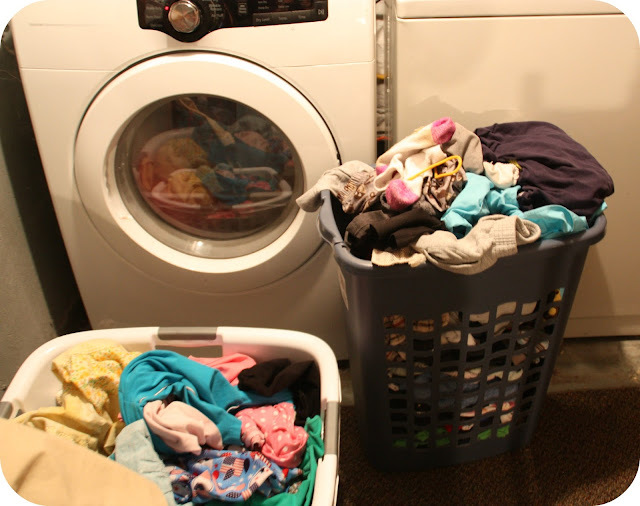 For this review, I was sent a bottle of Purex Plus Clorox 2 to try out and of course, laundry day was once again upon me a few days after my bottle arrived. You can use Purex Plus Clorox in your HE washers as well, so if you have one of those, have no fear...it will be fine. It is also color safe but if you aren't sure, just test it out on an inconspicuous area. My clothes came out of the washer smelling fresh and clean and just a tiny bit brighter than they went in...which is a huge plus. I will definitely be looking for this detergent in my store and will be purchasing more. Check your local store today and try this out today! Disclaimer: As a Purex Insider, I received no monetary compensation for this post. Purex did provide me a free sample of their Purex Plus Clorox 2 Detergent for review purposes. All quotes and stock photos are from the Purex website and email. Prizes are in coupon form and will be mailed by myself. This blog is not responsible for lost, damaged or stolen prizes and in this case, I am not responsible for replacing coupons under any circumstances. All thoughts and opinions are 100% mine. 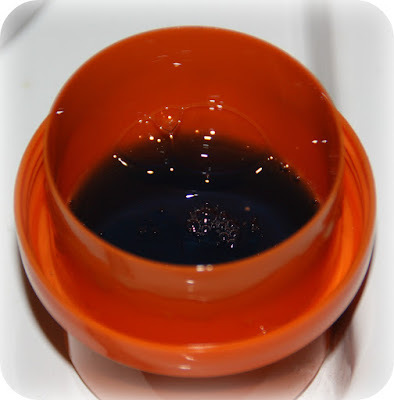 I pre-treat with Shout, but I find that if you get to the stain while it is still wet, plain old water will take most things out. I currently use a Shout stain stick for stains. I use a spray stain remover. I have been using oxi clean on clothing stains. I currently use Tide pens for tough laundry stain removal. I currently use Shout and pre soak any clothing with stains. I currently use a spray and wash of some sort...never gets it all out. 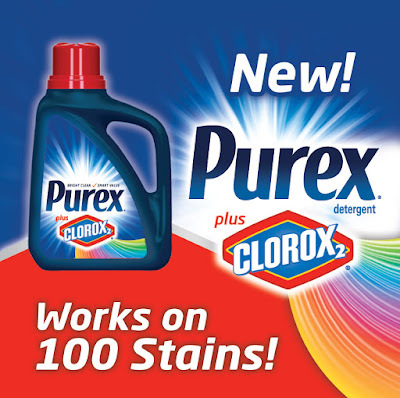 I would love to try the new Purex. Right now I use a Shout oxygen stain removal spray on tough stains. I currently use the store brand stain remover and Tide detergent to get out stains. I mostly just use some shout but I don't do enough because my kids will grow out of their clothes very fast. I use tide and clorox! I currently use shout spray on tough stains. I use tide stain remover. We use Purex and we love it. I use shout to get stains out. i hate dealing with grass stains! I usually use Shout to pretreat the baseball stains my kids get.